What are the main characteristics of Procedure Oriented Programming (POP)? As the name implies, Procedure Oriented Programming contains step by step procedure to execute. Here, the problems get decomposed into small parts and then to solve each part one or more functions are used. Thus in POP approach, the problem is viewed as a sequence of things to be done, such as, input taking, calculating and displaying. The primary focus stays on functions which will be used to accomplish each task. 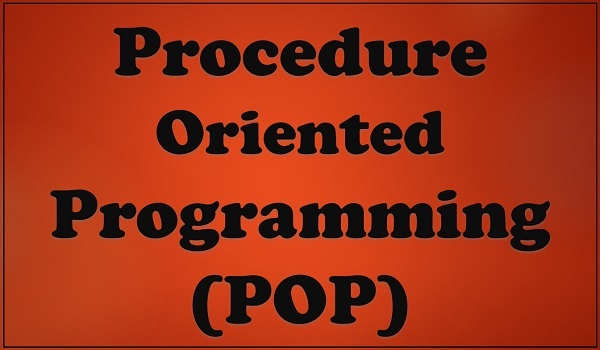 Read More: What is Procedure Oriented Programming (POP)? Puts much importance on Things to be Done. Large problems are divided into smaller programs known as functions. Functions transfer data from one form to another. Employs top-down approach in program designing. In the cases of large program, bringing change is difficult and time consuming. Appropriate and effective techniques are unavailable to secure data of a function from others. Read More: What are the problems of POP? How they can be solved with OOP?